The McWherter Library Fishbowl is a great space for collaborative projects & study sessions. Located in the First Floor Commons Room near the Research & Information Services desk. Not reservable for recurring meetings. Not reservable for individual use. The Fishbowl may be reserved for groups of 9-25. You must have at least 9 in your group to reserve for exclusive use. Reservation times may not exceed 4 hour blocks. 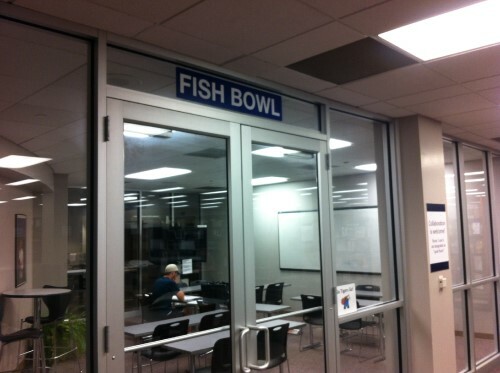 You may use Fishbowl without a reservation if your group is smaller than 9; others may use the room at the same time; if a group of 9 or more wishes to reserve the room, you may be asked to vacate the space. The Fishbowl has a TV with laptop connection capabilities (VGA, HDMI, & additional cables available at Check Out), modular seating and tables for up to 25, & a whiteboard (dry erase markers available at the Check Out desk). To book McWherter Library space for an event or to request permission for any alternate-use purposes, visit www.memphis.edu/libraries/administration/event.space.php.